Narrator: The place: New York City. The time: Now, 1962. And there's no time or place like it. If you've got a dream, this is the place to make that dream come true. That's why the soaring population of hopeful dreamers has just reached eight million people. Oh! Make that eight million and one. This is an homage to the light romantic comedies of the early 60's and a strong influence by "Pillow Talk". Renee Zellweger is Barbara Novack and she writes a book about women and how they look at relationships and an editor at a publishing firm named Vicki Hiller (Sarah Paulson) convinces the board of directors to publish her book. 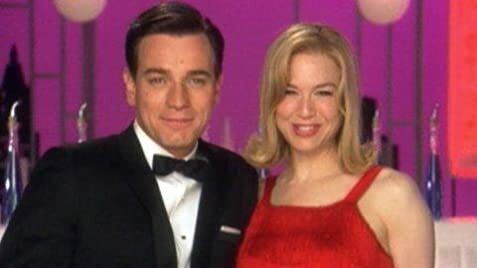 One way to get attention to her book is for a well known writer to write an expose of it so they try to get Catcher Block (Ewan McGregor) to do the job but he's so busy womanizing that he keeps canceling their appointments so they try other methods to get attention to her book and they succeed as it becomes a best seller. Catcher is amazed by her success and bets his friend and coworker Peter MacMannus (David Hyde Pierce) that he can make her fall in love with him which would make her a hypocrite and he would have a big story to publish. Catcher pretends to be a shy astronaut from Florida and they start to date. This film is directed by Peyton Reed who has worked almost exclusively in television and is directing the "Fantastic Four" next. Film does an admirable job of recreating those type of films that were prevalent in those times. The sets are terrific with the decor for the offices and apartments. Even the scenes like when Zellweger is riding in a car its obvious that its a sound stage with a movie screen behind them showing stock footage of 1960's traffic. The script also does a good job of adding some flavor of 1960's culture like when one of the board of directors describes her as "The Farmers Daughter" from Maine. This is of course in reference to Debbie Reynolds and when MacGregor says he's an astronaut from Cocoa Beach Florida its from "I Dream Of Jeannie". All pop icons from the sixties. And having Tony Randall in the film gives it the ultimate cavalier compliment. Its not a perfect homage like the scene where Paulson accuses Pierce of being homosexual which would not have been allowed during those times but the lighthearted charm of the film remains intact. Zellweger is fine as usual as Barbara but its MacGregor that caught my eye. His performances in the last two years have never ceased to be interesting. He was almost unrecognizable in "Black Hawk Down" and then shows he can sing in "Moulin Rouge!" But also shows he can handle playing American dialects. He's an amazing actor to watch and here he adds to his mystique. Film is utterly charming and it does compliment the films from the early sixties.